Below is a careful, thorough, honest, and, I feel, helpful review of where I stayed in French Polynesia on my vacation this summer. I wrote this for the website TripAdvisor, which I liked and have written several reviews for, until they rather insultingly rejected this one for reasons that I don't accept, but that very clearly let me know that from now on, they are not for me and I am not for them. In fact, I would actually like to remove all the reviews that I have posted on their site, as the thought of my words (which always remain as a precious part of myself) present there now makes me rather nauseous (but there seems to be no way to remove them, of course). I have noticed recently that TripAdvisor has a tight tie-in with Facebook, whereby a review or two of mine automatically ended up on my Facebook page by default. If you do not want this to happen, you have to carefully hunt for a box to UNCHECK. I am uncomfortable with so many things now automatically being posted on Facebook when you have not actually logged onto Facebook for the purpose of posting those things. Things I want on Facebook, I can easily go and post them there directly. Is Facebook going to rule my whole presence on the Internet? So many independently-created websites that become popular get swallowed up by larger sites, so that among entities like Google, Yahoo, Microsoft, YouTube, eBay, Paypal, Amazon, Facebook, and so on, it is hard to know which ones own the other ones. In my view, this has become all too "corporate", and TripAdvisor's recent attitude toward me is a clear sign that they are operating this way, now, too. As I write this, I decided to see who actually owns them, and discovered that either they are currently, or were previously, owned by Expedia...hummm, that's a nice scam...as people search for reviews of places on TripAdvisor, this is giving "price negotiating tips" to Expedia, which I have never liked because their prices are always higher than the others. I think maybe their having a hint that I have a strong desire to go to some place (based on the quantity of time reading reviews on TripAdvisor) makes them elevate the prices to that place. Could be. But, apparently Expedia got to the point where it wanted to "spin it off" (not quite sure what that means...sell it?) and there are on-line rumors that it will (or has already) become part of IAC, a multi-media and multi-internet conglomerate that I had not heard of until this moment, but which defines itself as the world's sixth largest network. So yes, I now see, all these things truly are "mainstream", which is to say, more powerful, and therefore more corrupt and less good for the user. Thank you very much for taking the time to submit your review! We value your contribution, and would like to be able to post it to the site. However, we're only allowed to post reviews that meet specific criteria and your review must meet the guidelines below before we can post it. If you'd be willing to edit and resubmit your review, we'd really appreciate it, and so will your fellow travelers! Your original review is included below so you can easily copy and paste it into the review form and make the necessary edits. We appreciate your contributions to the TripAdvisor community. Instead, I won't even bother to respond to them at all. Because now I have gotten their number, and no longer care about them. So, here is the review they rejected. I have not changed a word. If you are actually interested in the French Polynesia island of Fakarava, and especially are considering a stay at Raimiti, you might appreciate this review. I notice that there is NO review of Raimiti on the TripAdvisor site more recent than last January. Not a single one from this most recent high season. Thinking back over my experience of Raimiti, I realized how very unusual, and yet deeply magical the whole place was. I have read every review of Raimiti on this site, and I feel that every single thing said by anybody is true, whether good or bad, and I felt, myself, nearly every one of the things that other people said, plus many things of my own that nobody else has said. I would say at the outset that you must carefully read the Raimiti website so that you will have a full understanding of what is on offer there. I think once you read those words and understand what they are saying that you will feel in your gut whether you want to go to Raimiti or you do not. What you see on the website is what you get...look at those pictures...you will be there in that place, and it will look exactly like that. There is no fakery in those photos nor are they the product of photo-shopping genius. I, myself, took hundreds of pictures that look just like that and all I do is snap and shoot. Your own body and soul knows what it is that you hope to get out of a stay at Raimiti, and what you want may be different from what some other reviewers wanted. For example, many spoke of quiet relaxation and solitude, but I am not one who gets relaxation by doing nothing (I can, and do, read at home, and I can't stand lying still sunbathing), nor is solitude, per se, any special thing for me since I am quite able to be solitary at home. I know how to relax in even the most frenetic urban environment. But I found that what I could absorb from Raimiti that was infinitely relaxing to me was taking in that amazing blue color of the lagoon, or hearing the sound of the water lapping in what I thought of as "my tide pool" right outside my fare's front curtain (there is no closing door, and I didn't need one), or feeling the delicious shifting breezes blowing against my skin, or the motion of whatever boat we rode in as it sped across the water past perfect private white sand beaches backed by coconut palm forests. Instead of a place of solitude, Ramiti was a place for me that brought wonderful people together--from Italy, from Switzerland, from France, (from California...me), people of sophistication, intellect, sensuality, artistry, but, most of all, heart, which, if they were drawn to this place, that they surely have. Beyond the charms of Raimiti's beauty and setting, it was these people (two newly-wed couples in particular!) who made my experience there the magnificent thing that it was. And if these same kind of people were in a large resort, one might not ever know it or ever have the chance to know them. So at this point, if your study of the Raimiti website makes you feel within you a "yes", then here are some hints that might make your enjoyment even more assured. Times are hard on the island of Fakarava (a rectangular ring of somewhat separated motus around a clean, gorgeous lagoon), like they are around the whole world, making things more difficult for pension owners. Transportation seems to be a difficulty (lately, or maybe always), maybe fuel costs have increased or it is expensive to maintain boats, but there now seems to be a sharing of boats and "captains" so that there is no such thing as a "boat from Raimiti that will meet you at the airport for an hour and a half ride down the lagoon to Raimiti's motu". Instead, when you arrive, don't expect someone to be waiting there for you with a sign that says "Raimiti" on it, or perhaps your name (even though you will see that for some of the other, I guess larger, pensions). Instead, you will need to exit the airport with your luggage and go out to where vans are lined up and ask one of the drivers if he knows where the van is for Raimiti. That van may (will) have the name of some other pension on it, but it will be filled with people who will be dropped off at various pensions and guesthouses along the way. Even though there is actually a boat dock right there at the airport, nobody seems to use it for some reason. 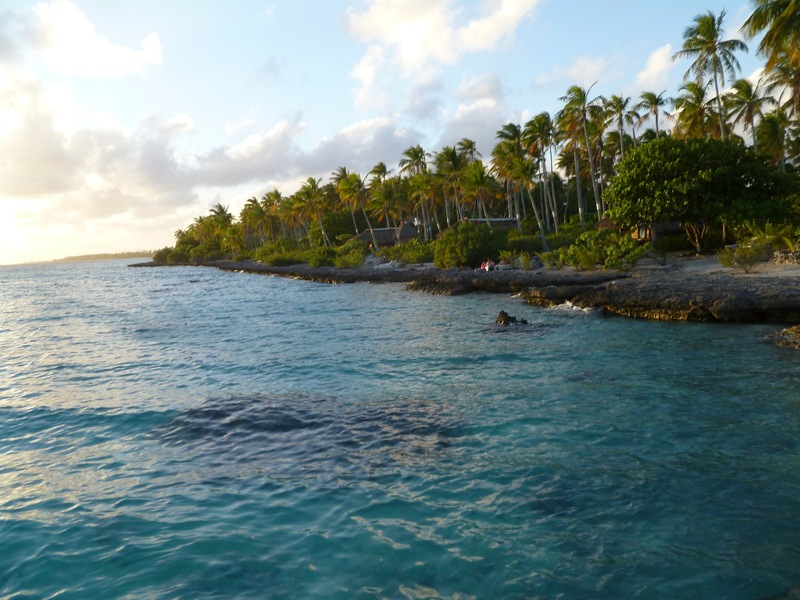 Instead, you will be taken to what seems to be the end of the only road on Fakarava, where there will be a small dock and from there you will be taken to Raimiti. On the boat, of course, will be the others who flew in on the same plane who are also going to Raimiti, but there also may be other visitors taking this boat who are going to pensions further down the lagoon from Raimiti. I recommend asking on the van who all is going to Raimiti so that you can already gain a familiarity with the other visitors who are going there with you. One other thing about this transportation...your departure from where the van drops you off may be delayed due to waiting for another plane that will arrive after yours, that is either bringing in some needed supplies for Raimiti, or, perhaps more likely, the arriving flight for visitors going to a pension beyond Raimiti. This is all to make this journey from the airport to the southern Fakarava pensions cost-effective, and the very boat you are riding in may actually be owned by one of those southern Fakarava pensions. A hint about bathrooms: the Air Tahiti prop plane you take to Fakarava DOES have a bathroom on it (hidden at the very rear of the plane); please be sure to use it before you land at Fakarava. The bathrooms at the Fakarava airport are not likely to be working, and you will not have a bathroom available after that until you get to Raimiti. If you understand these transportation conditions going into it, then you will not be upset when it happens. Disappointment comes when the reality does not meet the expectation; well, don't be disappointed. Let this be part of the whole adventure, HOW they need to do things on this isolated coral atoll. Make friends with your fellow visitors, who chances are will be wonderful. You're in this beautiful place, already, so you can enjoy it. When you book your trip to Raimiti, you have a choice in bungalows, the "Robinson" ones which (as near as I saw) were all on the lagoon side, and the "Crusoe" ones, which were all on the ocean side. There is some difference in the bungalows themselves, as you can see from the website, but conditions-wise, visitors say that the ocean side may be breezier (which some like and some don't--it's an advantage when there are mosquitoes), but also noisier. The way I look at it, the Robinson bungalows, while private, are more central to the action--the dining room is on the lagoon side and the boats operate from the lagoon side. This is like the "front yard". Also, you can swim in the lagoon and kayak on the lagoon. The lagoon is the sunset side, so it was wonderful to be located over there and enjoy the sunsets from the front of your bungalow. I loved my Robinson bungalow that happened to be the very first one after the dining room. I slept like a baby in there and woke up early, feeling fully refreshed. Showers were good...each bathroom has its own solar-heated water heater. I had gotten the good advice from Tripadvisor reviewer Cass, who suggested using "sailor's" shampoo since the Raimiti shower water could be slightly salty. I ended up getting Kirk's Castile shampoo, conditioner, and soap and it worked perfectly (this actually could have been used in the lagoon, itself, since it was biodegradable, but that wasn't necessary!). I always felt completely clean and refreshed. I am pretty sure that while I was there, no one was staying in any of the bungalows on the ocean side. (By the way, you do not swim in this ocean crashing on this reef, which is too rough.) While I was happy to have my bungalow on the lagoon side, my favorite special place was over in the isolated, empty, almost alien landscape of the ocean side, where I never saw another person. I liked to go over there early in the morning and see all the crab tracks (what I called "crab crossings") in the soft sand. Those crabs were partying during those nights! This was the sunrise side. But my favorite thing about visiting over on that side was what I called "Monument Valley"--hundreds, if not actually thousands, of rock and coral piles, statues, or monuments, some of them rather high, all of them unique, beautiful, and somewhat ominous in a way, as if the whole immense compound of them as far as the eye could see in either direction up and down the shore were part of an ancient "marai" honoring Tahitian gods, ancestors, or some other beings. When I first saw them, they were an amazing mystery, but actually, it really was no mystery--these had been built by visitors to Raimiti over the years as a way of keeping their spirit there in that place. So, I, too, made one. Those "memorials" were probably my favorite thing about Raimiti, maybe because they were so unexpected, mysterious, and full of careful artistry. If you go to Raimiti, you must check these out and then build one for yourself! There will be no electricity in your fare or its bathroom (either a separate building right next to it if you are on the lagoon side, or inside your fare if you are on the ocean side). Your light in your fare (and also on the steps in front of it) will be romantic blue kerosene lanterns, which Eric will give you the easy instructions as to how to use. However, you are are also given solar-charged flashlights for use during your stay. Flashlight headlamps are recommended for those who might want to read in the vicinity of their fare after dark. There are solar lights around in the compound so everything will have a soft, lighted glow. You won't be in the pitch black dark! In one of my favorite movies that comes from France, "My Father's Glory", which is autobiographical of the childhood of Marcel Pagnol, the family spends delightful summers in a house that they rent in Provence and the young Marcel romanticizes the kerosene lantern that they hang from a tree over their outdoor dinner table and lights the family's doings outdoors every evening. There on Raimiti with my blue kerosene lantern on the steps of my fare, I thought to myself, ah, yes, I have Pagnol's summer kerosene lantern, now. Meals at Raimiti (delicious, healthy, and beautiful) are breakfast at 8 AM, lunch at noon, and dinner at 8 PM. They will blow a conch shell horn to announce when the meal is ready. The conch will be blown before a boat leaves for excursions and for airport departures. When I was there, it was the wonderful Moe (pronounced "Mo-ae") who helped prepare and serve the meals and she was especially sensitive to and aware of the social dynamics within the dining room which I greatly appreciated, which had to do with which and how tables were set, and for whom, and in what combination of guests. I always felt cared for. Excursions may be variable depending upon various factors. Also, the conditions at each place may be variable, as well. It is best to take these as they come and presume that Eric (the owner of Raimiti) knows best. During my visit, we went on five excursions: twice to our group's favorite white and pink sand beach, once to the area of the village near the south pass, once to a protected bird nesting motu, and once to a "hoa", which is a shallow reef place where water from the ocean is flowing over into a lagoon area and has interesting shellfish embedded in the coral. You get to all of them by boat, although the favorite beach area could be reached by visitors on a kayak. In order to enjoy these excursions, I highly recommend that you bring a beach bag into which you can always carry reef shoes--I happen to like Salomon Techamphibian water shoes that worked really well when I thought to bring them--(thongs will not be sufficient because they are too slippery) or, alternatively, scuba-diving booties, snorkeling gear (mask, snorkel, fins, and booties because those fins are likely to gouge slices across the top of your feet if you aren't wearing protection), a beach towel, sunblock, and your camera. You will take hundreds of pictures. (I took about a hundred each day.) If you do not have reef shoes, you will be unable to enjoy much of the charm of each place you will be taken. For example, at the beach, you are likely to want to walk out through the water to an alluring distant sand bar, a walk that will really hurt your bare feet. The nesting bird motu does not have a sandy beach, but is made up of what I think of as "coral gravel". Worst of all was the "hoa" that (for some stupid reason), I did NOT bring my reef shoes, but instead, had on only thongs, which were all but impossible to use to walk across the jagged, broken-glass-sharp dead coral bottom. To show you how sharp that coral bottom was, I (also stupidly) jumped off the boat wearing my glasses, which, of course, gently floated down through three feet of water and rested on the jagged coral bottom. That mistake will cost me over a thousand dollars to replace the too-deep-to-fix scratched three-levels-of-correction progressive eyeglass lenses. All the glasses did was gently REST on that bottom and the lenses were ruined. What was happening to my hands and knees and legs...blood city. Fortunately, there were no black tipped sharks around to test their normally-not-interested-in-humans nature. One never seems to know when the snorkeling will be good or bad, despite what we are told. There was virtually no snorkeling at all at the beach, although there were some curious snakey-like fish, but that was all. We were told that snorkeling would be good in "the pool" in front of the village, but it wasn't really all that good, although there were some pretty yellow and also some beautiful blue fish. However, there were black-tip reef sharks which we cautiously swam with. While I had hugely hoped to have calving whales, dolphins, sea turtles, or manta rays, we never saw any of those ever, but at least we were in the water with sharks, so those became my memorable "big sea life" of this trip. 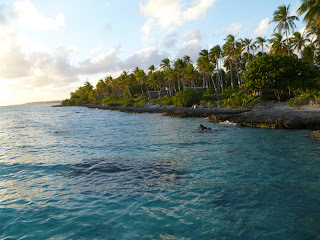 To me, snorkeling was best of all at the nesting bird island, where there were lots of examples of purple and other beautiful coral and several different species of fish. It was there that I got into a relaxed frame were I simply wiggled my fins and gently moved along peacefully, enjoying all the underwater sights. That ended when suddenly a fish shot past me in a panic and then I saw a black tip shark swim over, larger than the ones I had seen near the village. I figured that maybe I would feel more comfortable closer to the shore, so I purposely made my way away from the shark, not in a panic, but just wanting to be on the safe side. I would have liked to have photographed it with my underwater camera, but I used my energy to carefully move away, instead. But that was a great experience to have under my belt. Interestingly, my favorite place to swim was in the lagoon right there at Raimiti, and it ended up that there were thousands of a long, thin, blue fish right there around Raimiti's dock. So "home" maybe had the best snorkeling of all, after all, even though some reviewers found none there at all when they were there. One thing that I for sure expected us to do we did not do, and that was snorkel the south pass. However, the newlywed couple from Switzerland did scuba dive the pass and didn't find it to be all that impressive. The fantastic pass diving (and snorkeling?) experiences probably happen only at the peak in-coming tide times. Looking at some tide tables, I see that, of course, these peak times slowly progress day after day around the clock and at the time you are there, the peak tide time may be in the middle of the night or at some other time that does not coincide with excursion times. So this is not the fault of Raimiti, but conditions astronomical. If this particular experience is essential for you (especially if you are a scuba diver and are going to Fakarava particularly for this purpose), you might want to consult some tide tables or communicate with TOPDive about this issue and select your trip time accordingly. One dinner at Raimiti while we were there involved a fish barbecue right there at Raimiti, so that was a special activity that happened at Raimiti instead of on a distant motu. At Raimiti, of course, like at any hotel, guests arrive and guests depart. What isn't typical, though, is that if you have had any interaction with the guests at all, perhaps at a meal, or along on an excursion, you will then feel sadness when they leave. And then it will be time for you to leave, when you will be sad for yourself, but there are people there who will be missing you! It feels good, though, to feel a loss after the departure of a person whom you maybe knew for only a day, and I think that indicates the strength of what Raimiti really has to offer that I didn't see many (if any) reviewers talk about. And, of course, all those hundreds of piled stone and coral monuments stand in mute testimony of something important, too. There was only one bad, or problematic thing about Raimiti, and that is the language situation. While I had completed Pimsleur's French I language course (so one cannot accuse me of being the kind of American who expects everyone to speak English), it wasn't nearly good enough, for Eric was very "French" on this subject (of perfectly executed and preferably fluent French being expected and almost required), but who did know English, while few of the staff members had the slightest clue about English, although one could have some communication with Moe. This was not a total handicap for me thanks to three of the four newly-wed friends being quite good in English (one of whom worked professionally as an English/Italian translator of contracts and other legal documents, and another of whom actually taught English, as well as Latin and history), who kept me thoroughly abreast of the goings on that were not otherwise fully communicated to me. Throughout my stay at Raimiti, there were 12 visitors being there at various times; two were from French-speaking Montreal, six were from France, itself, two were from Geneva, Switzerland (where French is the language), which left only two of us who did not know French fluently. If you, yourself, are not fluent in French, I would not cause that to prevent you from going, but be prepared to feel somewhat isolated unless you have the experience I did of making friends with people who were fluent in both French and English (or whatever language it is that you speak), and who are generous in interpreting for you. I think I did not fully appreciate Raimiti until I was putting together a Shutterfly hardbound photo book of my trip. The page that got me emotionally was the last photo of the deep blue Fakarava lagoon at the airport before I got on my flight back to Papeete, and then home to Los Angeles. The sudden grief I felt showed how deeply the experience had embedded itself into me. I hope that you will find yourself having this same depth of experience with the place. And I hope that the friends that may make there become lifelong ones. When we returned from Malaysia, I wrote reviews of our two hotels for Trip Advisor and Agoda. Agoda published the positive and negative hotel reviews. Trip Advisor only published the good review. Trip Advisor would be the best known of any holiday review organisation and they need to clearly spell out their policies and review criteria. While I would still read TA reviews, I would not rely on them. Thank you so much for your feedback, Andrew! So TripAdvisor wouldn't even post your negative review? That's pretty horrible. I had not heard of Agoda, but will check it out. It's interesting to me how reviews of Raimiti (my rejected review) seemed to have stopped altogether (none from anybody who stayed there since January of this year). While for the most part I definitely liked it, there were others there at the same time who did not. And the objections that the owner no longer seems to care are very real, which could be a total deal-breaker for the place right there. I wouldn't go back to Raimiti, but I would go back to the somewhat maligned Sofitel hotel where I stayed in Papeete. To each his own, I guess, but each reviewer MUST be free to tell the truth as they see it; otherwise, it is useless. Thanks for your review. I had been considering a stay at Raimiti for part of our vacation next November. I too had noticed the lack of recent reviews on Trip Advisor. Also, the one negative thing that concerned me was the attitude of the owner. I have been to very basic tropical "out island" accomodations such as Raimiti, and for me the necessary things are water, food, bathroom facilities and hospitality from the management. The management need not be overly friendly but they need to care. How were the night stars? Did the soft glow of the lamps interfere with star gazing? Lynn, It is possible that owner is more friendly with those who are fluent in French, or maybe I would even go so far as to say he is more friendly with those for whom French is actually their native language. My stay there would not have been as pleasant as it was if I hadn't made friends with two couples there who were comfortable with English. As far as communication with the staff, only Moe (whom I found to be wonderful) was able to make even the most rudimentary connection with an English speaker (and even then I had to make a start with a few Tahitian words I got out of an English-Tahitian dictionary that I brought). The others were very competent in their jobs, but they were as interactive as, say, a municipal bus driver in a country that did not speak your language. Of course, it wasn't their job to be interactive, but it was a bit more distant than I had even expected it to be, and more than I have experienced in other foreign locations where there was no hope of having a common language. Other guests there have complained about that, so I think it does have a negative affect. I do think that many go there to experience near-total isolation, but I didn't need that, as I have vagabonded around in all sorts of distant places. I think isolation is easy to come by, even in the middle of Los Angeles where I live. (It can get very wild only a 45-minute drive away into the mountains or the desert.) And anyway, Raimiti, being intimate, is more conducive to socialization, I think, than an immense resort where while you see lots of people, you really can be "alone" and everybody stays a stranger. Bathroom facilities were good...I have no complaints about that at all. And I THINK the water was okay, but some guests were bothered that it was collected rain water served in refilled bottles. These guests were very picky about water (they wouldn't drink it even in the U.S.), so they demanded commercial bottled water, which they got. I was fine with the collected rain water. However, I got a terrible case of diarrhea which I swear came from the tap water on my final evening in Papeete. I made the automatic mistake of filling the hopper of the hotel room coffee maker with water from the tap. I've have Montezuma's revenge in Mexico, the well known place of "don't you dare drink the water", but that lasted only three or four days at its worst (two different times). But this Tahiti diarrhea is still not completely gone nearly a month later. Could I get that from one cup of coffee made of heated tap water? Or did it actually come from three or four days of Fakarava collected rain water? I will probably never know the answer to that, but I do ask you to be very, very careful with the water all over French Polynesia. If you go to Raimiti, maybe you, too, should demand commercial bottled water, but I am only guessing about that. In thinking about the whole thing, I wondered how difficult it would have been to have the driver of the van that served as the taxi taking various arriving guests from the airport to various pensions along the road, ending with dropping those for Raimiti off at an isolated dock to await someone to take them to Raimiti by boat, to BE THERE IN THE AIRPORT and have a SIGN listing, if not the actual NAMES of the arriving guests, at least listing the names of the PENSIONS that were being delivered to? Certainly there were other pensions there who did that, with the complete arrival-lei treatment, as well. But for us, nothing at all, and I had to ask around to find out what was up. And, of course, it would have been considerate to let us know that we were going to actually have a three-hour wait before any boat was going to take us anywhere, as they were waiting for the arrival of two different planes. Those of us who arrived on the first plane (the one we were all told to arrive on), would have been able to use that three hours to look around the nearby village, for example, maybe get a drink or a bite to eat...and GO TO THE BATHROOM! I would have liked to have taken a swim in the lagoon, as we had landed at 1:00 PM, and as it turned out, we did not arrive at Raimiti until dark (around 6 PM, if I remember correctly). Of course, this information might have lost them five guests, although I don't know, I can deal with situations better if I know what's up instead of waiting around not understanding what is going on for three hours. These little pieces of inconsideration (or total lack of professionalism) tell me that the place is hanging by its last thread, as nice as it is when you actually do get there. If their guest load is diminishing dangerously, I would think that they would even more greatly honor those that they have, instead of sloughing them off as a waste of their time. We did not see any stars at all, but I have no idea why. I don't know if I would blame the lanterns, though (which were very pleasant and beautiful). But there was not even a hint of stars the three nights I was there. There were a lot of things I hoped to get, but did not--no drift snorkeling in the south pass, no sight of any large sea-life (dolphins, turtles, manta rays, I even hoped for whales, but I knew the chance for that was slim). They only good thing along those lines was the black-tipped reef sharks, which I can now say I swam with, even though they basically aren't dangerous! (But not entirely...I later read that they will sometimes bite the legs of people wading in the water, but they won't attack swimmers under the water, unless they are being fed nearby, then they might attack them, too. Of course, we weren't told anything about this either as a warning or to allay ones fears. Maybe it was explained to the French speakers? I was the only in our group who swam with the sharks, by the way! Basically, the experience was beautiful small beaches and wonderful lagoon water. Not the best snorkeling anywhere we went; not much in the way of fish or live coral. Lots and lots of seven million year old DEAD coral, though, like the surface of the moon. The food was good, although I don't remember much about it. Lots of seafood and salad and bread. It was more memorable dining in Papeete, but maybe that is just me. Actually, it was more memorable dining once I got back home to Los Angeles! A wonderful lunch at Paradise Cove on the sand in Malibu, a fantastic breakfast buffet at Ports O' Call Restaurant sitting outside by the main shipping channel of the Port of Los Angeles, and a great steak dinner outside on the patio of the Grizzly Cafe in the mountains at Wrightwood, to name a few. Yes, Auntie Em, there's no place like home!